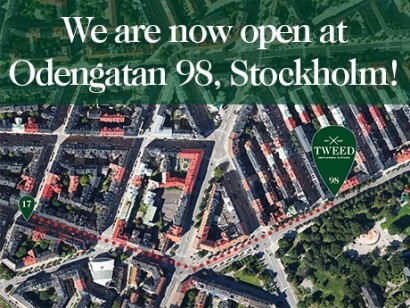 You are welcome to visit our new shop at Odengatan 98 in Stockholm. Here you will find a choice selection of products from all our brands, and also have the opportunity to place custom orders from our large sortiment. For more than a hundred years, gentlemen’s clothiers have resided in these rooms. Now we will humbly carry forward the tradition. We continue our ten years long celebration of British sartorialism in the new shop at Odengatan 98. For us the tweed season is never off, and we always have plenty of genuine tweed jackets available in heavy as well as light weight. Every autumn we have several deliveries of seasonal tweed jackets, suits and coats. We also fill up our stock of tweed shooting coats, vests and breeks. We strive for a classic well tailored look and work with traditional structured jackets as well as unstructured jackets. Of course we have much more than tweed. CorduroyCorduroy is a textile composed of twisted fibers that, when woven, lie parallel (similar to twill) to one another to form the cloth's distinct pattern, a "cord." Modern corduroy is most commonly composed of tufted cords, sometimes exhibiting a channel (bare to the base fabric) between the tufts. Corduroy is, in essence, a ridged form of velvet. In Sweden known as "Manchester" trousers, lambswool jumpers, English shirts, wax jackets and handmade shoes from Tricker's are staples, but we also stock many garments hard to find elsewhere. Cavalry twillA fabric woven in parallel diagonal ribs, by passing the weft thread alternatively over and under one or more warp threads. Tweed, gabardine, cheviot and denim, for example, are all twills. trousers, tattersall check wool waistcoats and colourful contrast trousers are but a few examples. During the warmer season we offer linen suits and jackets, tan shoes, Panama hats and cotton twill trousers for a truly British summer countryside look. If you prefer spending your lazy days on a city piazza we have some nice odd jackets and trousers to keep you in style. Saturdays customers can place custom orders from the esteemed Northampton shoemaker Tricker’s. All lasts, styles, soles and leathers are available and the right size will be expertly fitted. We offer made-to-measure tweed and business suits in Bladen's distinctly British Savile Row style. Please contact us for an appointment. Suits starts at 9 000 SEK and a three-piece tweed suit in Supasax tweed is around 12 000 SEK.